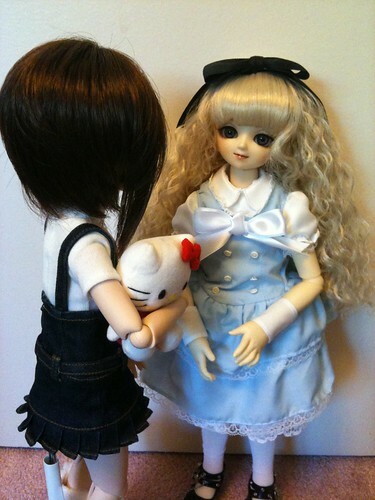 Here’s Medée meeting her cousin Zephyria. She brought over one of her spare Hello Kitty plushies as a gift for her cousin. 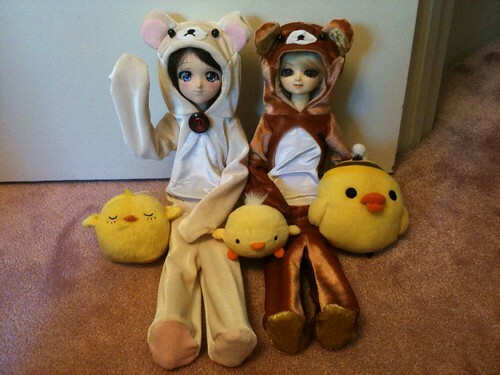 One of the things I was curious about was to see how well MSD and MDD (Mini Super Dollfie and Mini Dollfie Dream) outfits can be interchanged since the Volks website has them listed as such, but there are bound to be some differences. So Medée and Zephy swapped outfits and the results were interesting. The MSD has somewhat broader shoulders and waist so it fits a bit snugly in the MDD outfit, and as a result the MSD dress is loose on the MDD. I also noted that since MDD’s have thinner ankles most of Zephy’s shoes didn’t look right on Medée, even though when I compared their feet they are roughly the same size. It was quite peculiar! And then the yellow birds came out to join them! Later on Zephyria borrowed some stuff from Ventus’ wardrobe and dressed up as a dandy. Here they both are looking very spiffy! 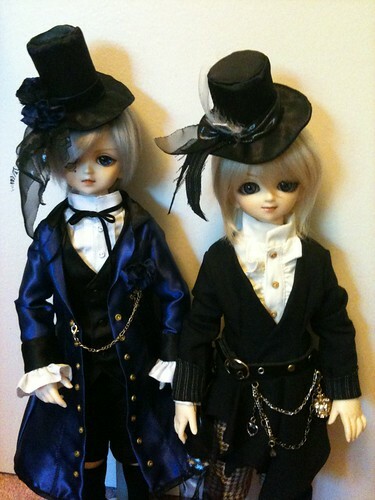 Ventus is wearing his Ciel Phantomhive cosplay made by Machiko. 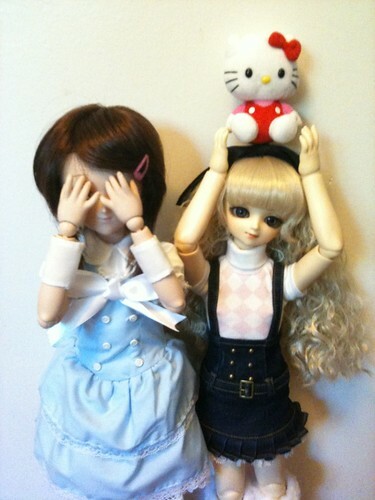 Here’s Makoto finally meeting Moe! They look so cute. Unfortunately Makoto will be staying with auntie Machiko for a bit longer so she didn’t come home yet. 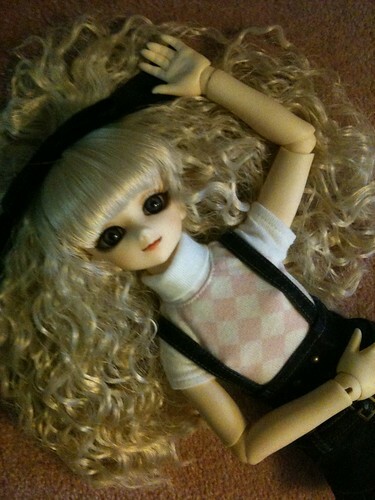 My friend’s Abio Angel doll, Kaiyouko (Kioko? 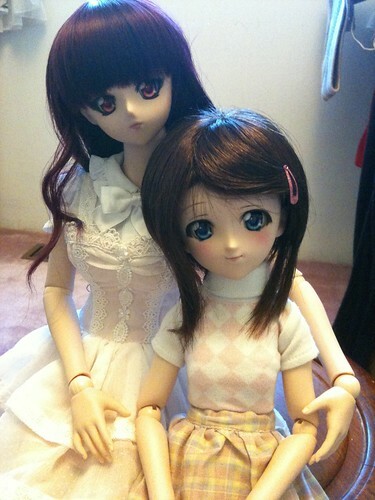 ), was also visiting, but she’s undergoing a new faceup at the moment so I didn’t take photos of her. 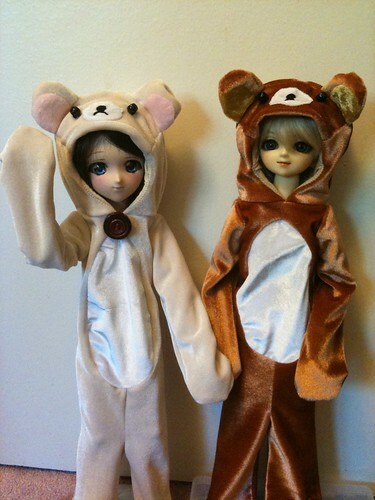 If anyone is curious about the bear PJ’s, you can contact my sister through her blog. I know she had some for sale on etsy before, but I think she sold out out of her pre-made ones at Anime North. This entry was posted in Dollfie Dream, Volks Super Dollfie and tagged MDD, Medée, Moe, Zephyria by archangeli. Bookmark the permalink.